The British NGO Oxfam released a study that shows natural disasters have quadrupled as compared to 20 years ago, an increase due to global warming. Oxfam's Report Up in Smoke is here (PDF, 96 p). Here are data from another NGO, Germanwatch, a Bonn- and Berlin-based think tank and foundation focused on North-South justice, sustainability, and "climate protection" (Klimaschutz). Germanwatch is affiliated with the US NGO Worldwatch Institute and publishes the European version of the annual State of the World Reports. It gets its funding from the Heinrich-Böll Foundation. Germanwatch releases the Klimaschutz-Index or "climate protection index". Here are links (pdf files) to the reports 2006 and 2007. The 2006 global average concentrations of CO2 were higher than ever in measurements coordinated by the World Meteorological Organization. The "climate protection index" by Germanwatch is a ranking determined by the national sum-total figure of per-capita CO2 emissions (50 percent: energy, transportation, buildings, and industry); the national power-related CO2 emissions (30 percent: national status quo); and the climate policy of the country in question (20 percent of the ranking number: domestic and international policies). The index is a ranking of the 56 nations that are collectively perpetrating 90 percent of global CO2 emissions. (For tables, cf. Klimaschutzindex 2007, p. 4-5; for calculations, l.c. p. 8-13). Nice going, USA! In ecological terms, you're rock bottom! Under the Climate-Changer-in-Chief, you're worse than Kazakhstan! Hahaha! Happier news come from Australia, where the Climate-Changer-in-Second John Howard suffered a resounding defeat, and the Labor Party Leader Kevin Rudd won the election. (Note: in contrast to the USA, Australia enjoys fair and square elections -- while Ausssies have electronic voting booths, just like Gringos, they get printed receipts of their vote, unlike the Gringos, which makes it harder to manipulate numbers.) Indonesia, UK, and NZ congratulated Rudd's victory as a victory for Kyoto. Rudd won on a platform charging that Howard "is out of ideas". Rudd also signaled that the Aussies will pull out of Iraq. Meanwhile, water predictions for Queensland are grim, and there's crazy weather in South Australia and Victoria. New Zealand's glaciers,whose meltoff made news in September, are making more news; NZ's NIWA (National Institute of Water and Atmospheric Research) reports that New Zealand's glacier melt is now quantifiable as an 11 percent loss in the past 30 years, and as a 90 percent loss in the 12 largest glaciers in response to global warming, and that without change in the snowline. According to J. Salinger/NIWA, NZ's big twelve "have passed the tipping point." San Francisco's Bay Area Air Quality Management District is holding public hearings on whether fireplaces should be banned. They will have to ban them eventually since there's no choice -- it's part of the great cultural evolution now underway. Here's a good post by Kunstler on this cultural evolution. Here's the Red Cross advisory for drought-stricken Georgians. The dollar keeps losing against the Euro. 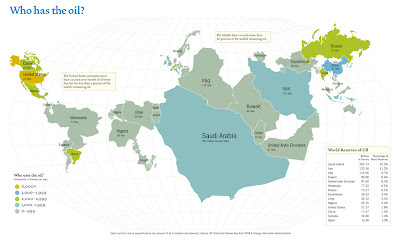 Here's a map of world oil reserves, with each country's size proportional to the amount of oil it owns. The size of Iran!! Meanwhile, Iran's prez wants to trade oil for Euro. US Grunts in Iraq commit suicide. (Note that the US deaths mentioned, 15,000, don't include combat-related fatalities recorded in Germany's military hospitals; neither do they include the classified numbers of mercenaries or "private contractors" KIA.) Joseph Stiglitz (Columbia U), 2001 Economics Nobel Laureate and formerly chief economist of the World Bank, published an informative essay on "the catastrophe that was the Bush administration, called Reckoning: the Economic Consequences of Mr. Bush. Rowan Williams, the Archbishop of Canterbury, declared in an interview that the US is creating the worst of all worlds.